Over the last few months I have shared lots of new collections for 2017 with much of the focus on wedding dresses (if you missed Dreamers & Lover’s last week, it really was a MUST see), bridal accessories and shoes, but today I have something for you paper lovers! I am so excited to be sharing some of the beautiful wedding invitations from one of my favourite online resources for all things stationery, Wedding Paper Divas – as well as news of their FREE sample kit! Wedding Paper Divas offers thousands of on trend wedding invitation suites at every price point. From letterpress and laser-cut to foil-stamped, and digital printing, they have it all! Their user-friendly website allows you to easily search their curated collections by style, theme, color, price, and more to help you find your favorite invites. And the best part is that they are all customizable to the smallest detail! From finishes, to colours and paper type, you can tweak the designs you love to create the perfect stationery to suit your wedding theme and budget! Oh and if you want to complete your suite with personalized extras such as bridal shower invitations or save the dates with photos from your engagement session; address printing and custom postage for your invites; or menus, programs, table numbers and even coasters for the day; it’s easy because Wedding Paper Divas has all of those goodies too! Now Wedding Paper Divas has made the stationery buying process even easier by offering not only beautiful designs, but brilliant FREE sample kits! It’s not very often couples actually get the chance to touch and feel their shortlisted stationery designs before purchasing, but now you can buy with confidence having experienced their quality firsthand – felt the weight and thickness of the paper, the smoothness of the glossy foil or the crisp laser cut edges. And there are a whole selection of goodies that come with your kit! 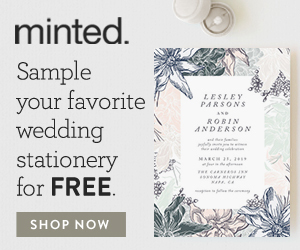 Their comprehensive sample packet features a wedding stationery guide, matching RSVP cards, color and paper swatches, a font options card and matching envelopes. Choose up to 8 designs and use the code FREETRY at the checkout for or your free sample kit. Plus, get an exclusive discount of 20% off and free shipping! If you are interested in appearing on these pages please read CVB’s Advertise page, which outlines some of the opportunities available and email me at amy@chicvintagebrides.com should you like to know more.